We combined a visit to Seaham with a camping trip to the very North East of England (I’ll write more about the rest of the trip in another blog post next week). Having our campervan means we’re pretty flexible about where we stay and we planned this trip to make sure we’d have an opportunity to search for the famous sea glass. Well it did not disappoint! I had thought that perhaps it would have become a victim of it’s own success and there would either be no sea glass left or just too many people searching for it. But this is not the case at all… it’s a wonderful beach which is unspoilt and a pleasure to visit. …on our first evening I found this little lot- just look at the colours! We returned to Seaham the following day for more sea glass hunting… and it wasn’t just me that seemed to enjoy it. Our eldest who’s 15 surprised us by really wanting to find it too… he found some really beautiful pieces. I think it’s because there are such special and unique pieces to be found that you feel compelled to keep looking. It became a family affair as we’d also arranged to meet my parents on the beach who were visiting the area too! We met and spoke with fellow sea glass searchers on the beach that day. One couple had flown all the way from Cornwall that morning and were flying back the same day! They travelled all that way just to search for sea glass on Seaham beach… I asked if they were using it to make jewellery or for any other business purpose but no, the lady said she just found it so therapeutic and it was something she loved doing. I can assure you I let out a hugh cry of excitement when I spotted that! 🙂 🙂 It’s a piece that Seaham is famous for…the two coloured pieces that must be from the more elaborate glass that was made in the factory a century ago. To think it’s been swirling in the sea for 100 years and then I found it there at my feet is a very special thought! I felt my sea glass hunting was complete! We did go back to the beach for one last visit the following morning, just for a quick 20 minute stroll (it’s pretty addictive this sea glass hunting!) and I’m super glad we did. Because a fellow Instagram follower Daisy Sea Glass who is based around Seaham had seen my crocheted pebbles and been inspired to do some of her own and yarn bomb the steps at Seaham! Through our contact on Instagram I knew she had done it but by the time we arrived on our first evening they had all gone! 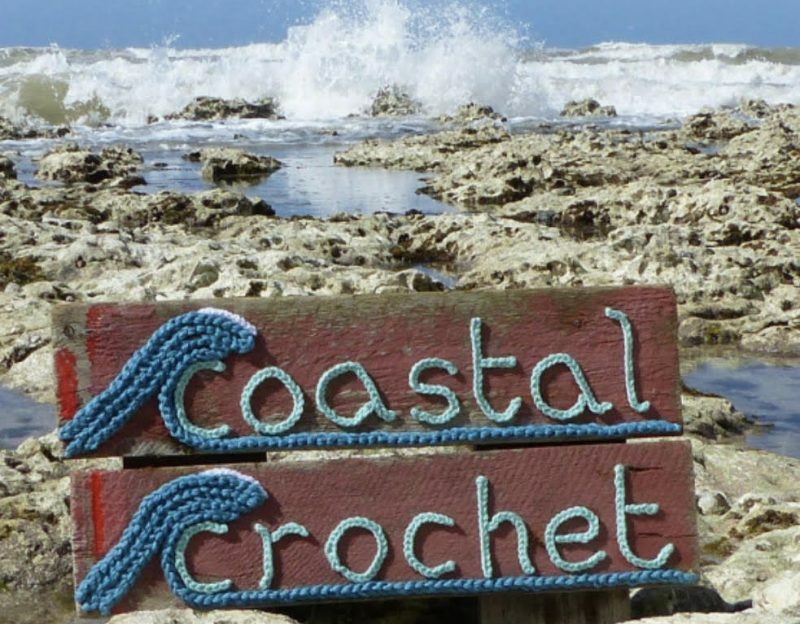 😦 😦 But she put up just a few more around an information board and I’m so happy to have seen it… Crochet at Seaham inspired by some of my own crochet- Wow! Looks like a fun time😀. That red glass is beautiful, what a find! Thank you so much for giving me an opportunity to recall our own trip to Seaham, it really was one of my best holidays ever. I’m so glad you found such beautiful pieces of glass. Maybe one day I’ll have my pieces shipped over here and I can try your seaglass crochet pattern. I must go, only an hour and a half drive from me, surely I can manage that! Looking for sea glass is addictive!!! I don’t collect sea glass but I can totally join your excitement being somewhere that’s known for what you like to collect. What a wonderful experience. We used to make day trips out to Seaham from Durham but I had absolutely no idea it was sea glass heaven!! What an amazing place! I absolutely love Seaham!! 🙂 great blog! We used to collect ‘colored pebbles’ whilst playing on the beach in Aberystwyth. Then as a teenager I’d sunbathe and filter through the stones around my towel. They were mainly green and brown there. I was trying to think why there would be so many and can only imagine that it may have been to do with the brewery discarding their bottles into the river/sea.